On a recent backpacking trip, a friend brought along one of the smallest camp-stoves I have ever seen. 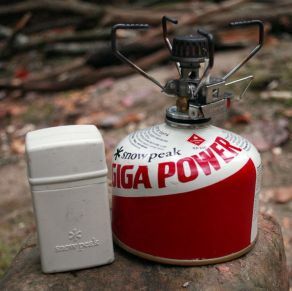 The Snowpeak Giga Stove is so tiny, you could mistake it for a lighter. (It fits in the white case to the side). At $35-50 depending on whether you get the stainless steel or titanium model, this is not an expensive campstove by any means, especially when you consider the weight tradeoff. We used it to prepare coffee in both ThinkSport and Nalgene bottles (with a nifty coffee-making insert). The stove also worked wonders on canned soup (a blessing after a day on the trail) and, being Southerners, instant grits for breakfast. If you don’t have a water source handy, you can always pack in your fluids, but fortunately for us, we’re fishermen, so there’s always water somewhere. When using river water for coffee or food prep, be sure to bring it to a boil for at least a minute before using it for cooking. That will ensure that even the dreaded giardia parasite is good and dead. What’s your favorite hot end-of-trail food? Know any tips on killing dangerous parasites? Let us know in the comments section!